You've heard all the infamous lines concerning the barbell squat: "The squat is the King of all exercises." "Without doing squats your legs won't grow." "Shut up and squat." "If you don't squat in your training program, you don't have a program." The fact of the matter is, you do not need barbell squats in your program to build strong muscular legs. Am I saying not to squat? No! What I am saying is that it is not the end all. So what other options do you have? Single leg squats are an excellent alternative to barbell squats. Talk about an exercise that builds strength and size along with stability! 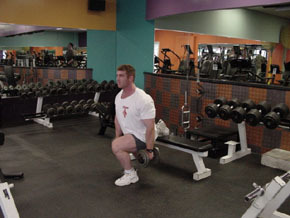 Single leg squats incorporate the need for balance more than any other leg exercise. The more unstable the environment the more the muscles have to work at performing the task. Because you have the added factor of balance, the single leg squat is much more difficult to perform than the barbell squat, just as the barbell squat is much more difficult than the leg press. Just this week a guy came up to me while I was performing single leg squats. I've seen him do six good reps with 495 pounds on the barbell squat before. He asked if I would show him how to perform single leg squats properly. To make a long story short, he barely squeaked out eight reps with 50-pound dumbbells on his right leg and got only six reps with his left. Granted, there is a learning curve but this is a good example to point out the difficulty of this exercise as compared to the barbell squat. Muscles involved: quadriceps, hamstrings, glutes, adductors, abductors and erectors to some degree. This is an excellent movement for stabilizing the knee and hip joints. Stand approximately three to four feet in front of a flat bench. Put the top of one foot on the top of the bench. Look straight ahead with your chest up. As you lower your body, throw your hips back until your upper thigh is parallel to the floor. Slowly push yourself back to the starting position.